As delegates gather for today's inaugural Camden & Islington Air Quality Summit today, Islington Green Party campaigners have released figures showing that air pollution figures are twice as bad if you're the height of a child than if you're an adult. Caroline Russell, a long-time road safety campaigner who commissioned the research, revealed that nitrogen dioxide levels exceeded national and European target limits in half the measuring stations across the borough. In addition, levels were twice as bad at child-height across Islington than at the 2.5 metre height most commonly published. And they must start measuring air pollution at the height which actually affects adults and children rather than far above the head of the world's tallest person, which is where most air quality monitoring devices are in London. Caroline Russell, the Green Party candidate in the recent Islington by-election, said: “The figures at child height in particular are terrifying. 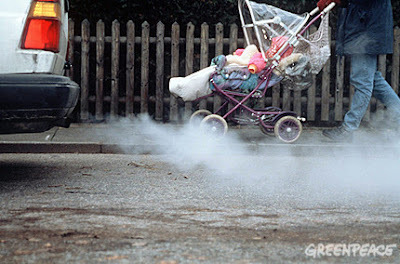 As well as commissioning further studies, our representatives in the council must look at ways they can work with the Mayor to reduce air pollution locally, and all of us in London must consider what we can change to avoid exposing children to such high levels of NO2."